Scheda: Nazione: Hong Kong - Produzione: Raymond Chow - Distribuzione: Century Pacific, Metropolitan Filmexport, Tai Seng Video Marketing - Soggetto: Shui Chung Yuet, Jerrold Mundis - Sceneggiatura: Shui Chung Yuet, Jerrold Mundis - Fotografia: Bill Wong - Montaggio: Chi Kwong Shek - Musica: Kwan Shing Yau - Effetti speciali: John Scheele, Peter Kuran - Formato: Color, linguaggio cantonese - Durata: 95'. Cast: Biao Yuen, Hoi Mang, Adam Cheng, Moon Lee, Brigitte Lin, Damian Lau, Sammo Hung Kam-Bo, Judy Ongg, Norman Tsui Siu-Keung, Hark Tsui, Hark-On Fung, Kwan-Li Shen. Trama e commenti: hkx.it: «Zu: The Warriors from the Magic Mountain è un'esperienza dalla quale non si può che uscire spossati, spogliati di qualsiasi verità precostituita o facile strada interpretativa. Sfuggente proprio nella sua poliedricità, incontenibile nelle sue mille sfaccettature, si dimostra un film multicentrico e polimorfo, difficilmente inquadrabile....». Plot Summary, Synopsis, Review: IMDb - tvguide.com - metalasylum.com - entertainment.msn.com - allmovie.com: «Legendary Hong Kong filmmaker Tsui Hark spins this lavishly designed fantasy epic featuring some of the most cutting edge, oft-imitated special effects of the day. 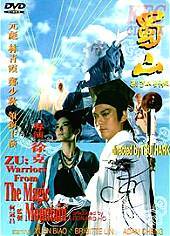 The film, set in 5th century China, centers on Ti Ming-chi (Yuen Biao) a young innocent from the West Zu army who wandered away from the battlefield and into a magical underworld filled with demons and murderous swordsmen. 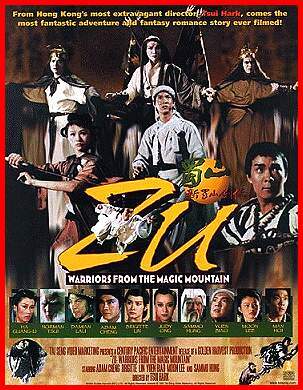 When his life is saved by the noble warrior Ting Yin (Adam Cheng Siu-chau), Ti joins forces with his band of fighters — including a Buddhism monk named Abbot Hsiao Yu (Damian Lau Chung-yan), his klutzy underling Yi Chen (Mang Hoi) and a fearsome old wizard named Long Brows (Sammo Hung) — in their quest to save the world from the terror of the Blood Demon. In spite of Long Brows' powers the Demon attacks and poisons Abbot Hsiao. 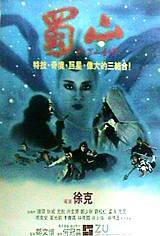 Ting and company take the injured monk to the enigmatic Countess of Jade Pond (Brigitte Lin Hsia) hoping that her skills can cure him. Though she manages to cure Hsiao, the demon soon possesses Ting. 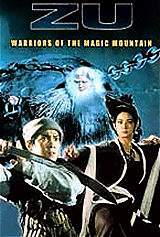 The combined power of Ting and the demon are too great; the Countess can only surround her castle with a solid block of ice and wait while Ti, Yi and one of the countess's guards (Moon Lee Choi-fung) ventures to the top of Blade Peak to find the legendary Twin Swords» (Jonathan Crow). Conosciuto anche con i titoli: Zu Time Warriors; Zu Warriors; Zu: Warriors from the Magic Mountain; Zu: Warriors of the Magic Mountain.